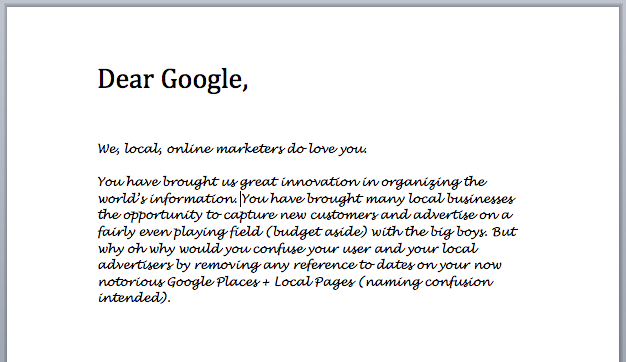 A brief, but pointedly confused, open letter to Google. We, local, online marketers do love you. You have brought us great innovation in organizing the world’s information. You have brought many local businesses the opportunity to capture new customers and advertise on a fairly even playing field (budget aside) with the big boys. But, why oh why, would you confuse your user and your local advertisers by removing any reference to dates on your now notorious Google Places + Local Pages (naming confusion intended). I do give you much credit. I do believe your team is top-notch. I do wish I had folks like Amit Singhal and Matt Cutts on my team. In this most recent change, however, I am perplexed. I use Google to find information… recent, relevant, timely, etc. etc. If I am researching potential purchases and comparing Business A to Business B, how could I not benefit from knowing when a review was made? Maybe Business A used to be abysmal but listened to the consumer feedback and has since changed. Maybe Business B used to be a shining beacon of consumer satisfaction but made some poor hiring decisions that have since diminished its previous standards of customer satisfaction. But how do I know? Without dates on these reviews, how do I know if a business has improved its service over time or not? I have been flexible and changed with you from 5 stars to 4 words to 30 points etc., but this change has really hurt me. I like Google because I can use it to get more customers. I want my customer experience to be transparent. I want consumers to be happy. How on earth can I engage with my own listing page, understand and participate in a strategy that leaves no reference to time? Google, you can contact me with an explanation at [email protected]. I’d be happy to reply using my Android phone. I’ve included screenshots and links to various businesses affected by this change, in multiple industries. I noticed this today too Brice. Did you see that the individual reviews no longer carry an individual score? Yet you can still sort them by Highest or Lowest score… Honestly, this has to be a glitch, right? Right? Please? I think one of the best things dealerships can do is look for ways to spread the word about this on the local level. Business publications, weeklies, radio shows, whatever–communities need to know how carelessly Google treats the online reputations of businesses. What other recourse does anyone have? 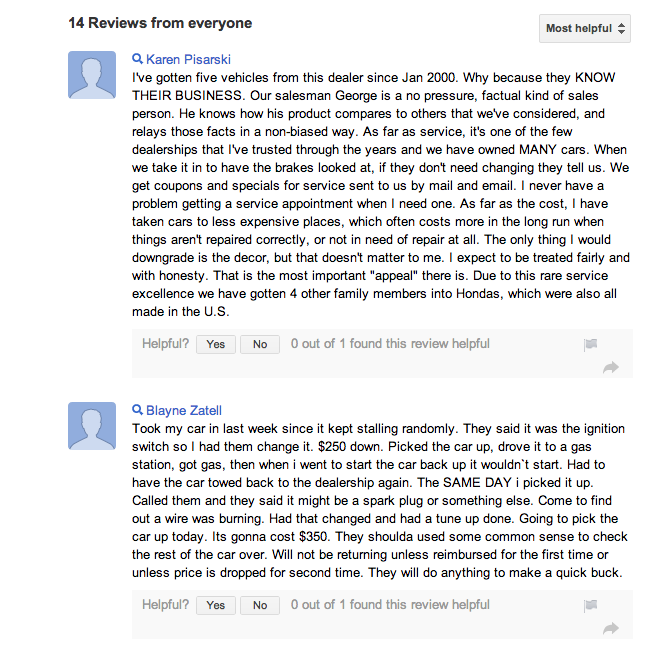 When our dealership lost hundreds of reviews, we complained to the FTC, the Better Business Bureau, and to several Google AdWords reps, and the general consensus of the responses we received from Google was always something like this: That we should just sit tight and “have faith” that Google is creating a better experience for everyone. Whether this latest insult is a glitch or not makes no difference to me at this point. Ultimately, the message is this: You don’t get to have a “review strategy.” You get what they give and that’s it. I was amazed at how many people left comments on the various news stories about our loss of reviews saying “you get what you pay for. It’s a free service so don’t complain.” It is NOT a free service. Those review scores influence the spending of real dollars, and Google seems to be treating this project like some kind of digital dry erase board. Will this stop me from using Google’s other services? No. But I take every chance I get to spread the word about this shameful mess. Aaron Wirtz Great points spoken from great experience. I think your points of filing feedback on Google’s business practices is important. Operating a digital monopoly is clearly their intent and under the guise of “better consumer experience” can be challenged with this type of move. Also, brief update, I did reach out to my contact at Google who quoted a 24 hour turnaround on an explanation. I sincerely hope this is a bug. jrleslie I did notice that, but only for certain industries as of yesterday morning… it looks like most business types no longer have that. BUT, if you try to leave a review, Google still asks for your categorical feedback… AND you can still see the categories AND scores in the mobile version of the G+ page. Makes total sense, right? I am assuming this in in motion. I hear it is a glitch Google has been working on..
Are you guys still seeing this? Brian was right… even Google has glitches. Would love to know how this one came about but as of now time and individual review quality references are back online. It appears this was about a 72 hour bug.